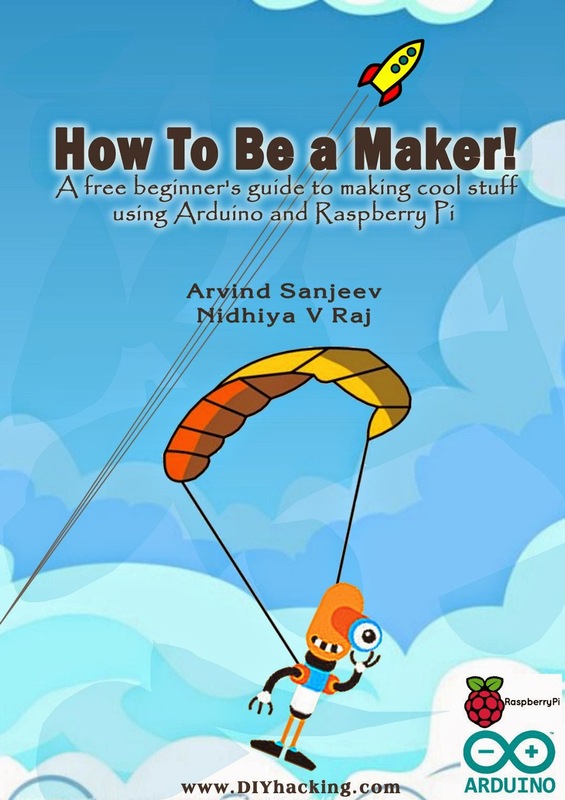 I have currently authored an eBook titled "How To Be a Maker", which is intended to be a beginner's guide to getting started with working on projects using Arduino and Raspberry Pi. This free eBook is being released through the platform which I instigated to promote open source projects from our country, called "DIY Hacking". 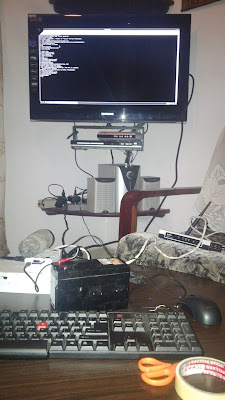 Its main intention is to promote awareness about such easy open source tools for rapid prototyping (Arduino and Raspberry Pi), as many of the students in our country are still not exposed to such easy tools, especially since most of the universities fail to update its academic syllabus. This initiative also tries to promulgate a more pragmatic approach to technical education, rather than just confining to the books. Fin - Wear the World! Seeks to eliminate the need for a user to take their phone out of their pockets for simple tasks like answering calls, changing soundtracks, notifications, etc. 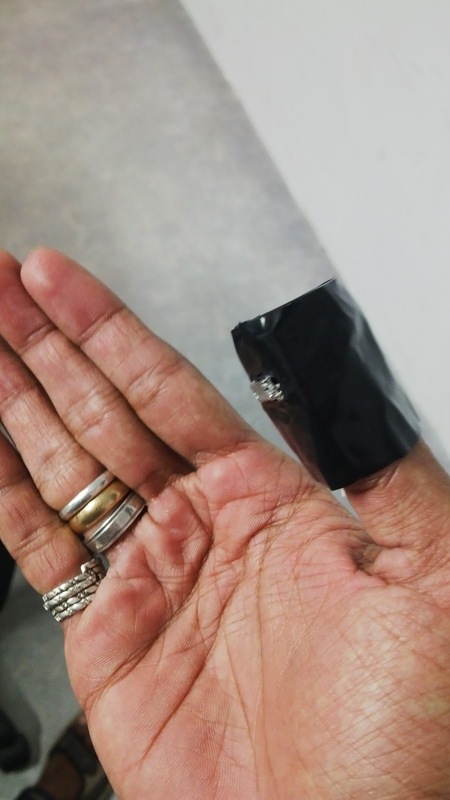 Could be used while the user's hands are engaged in other activities, like during driving, exercising, etc. 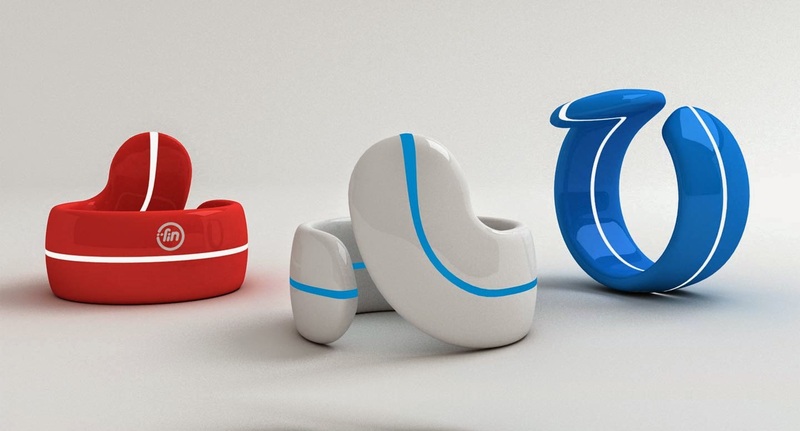 Could be used during working out to measure body movements, calories burnt, etc. Could be used to measure irregular sleep patterns. Can be used during gaming to give the user a touch less playing experience, hence utilizing the entire screen for viewing. Fin has enormous potential for the future. 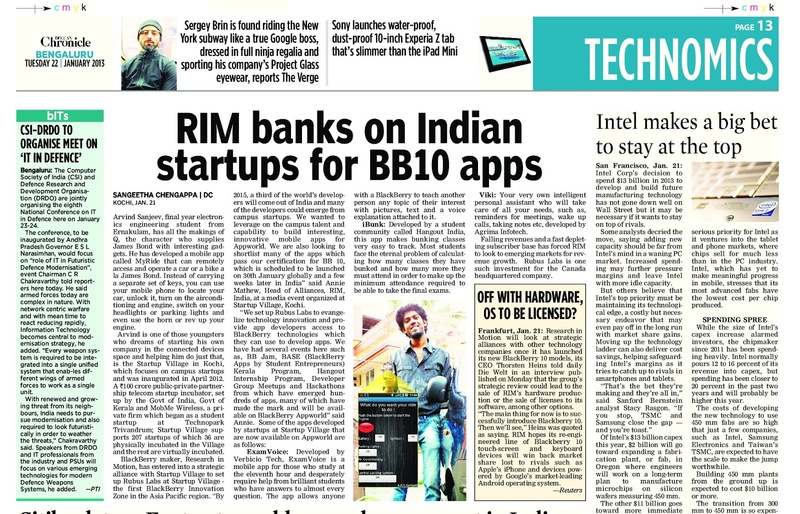 Opensource APIs are also going to be released for developers , so that everyone could start making Fin based applications such as for home automation, etc where a swipe of your finger could control the lights in your room ,etc. 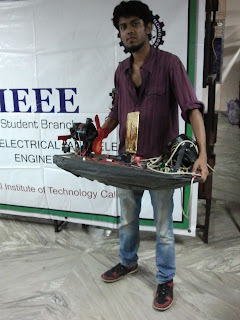 So this one must be the most hardest and frustrating one of them all, everyone must be familiar with the 4 motor propelled flying copter from the movie 3 idiots, so in the movie there was a situation where the damn smart Ranchhoddas Shamaldas Chhanchad (Aamir Khan) saves the day by helping a kid to complete his project which was this. 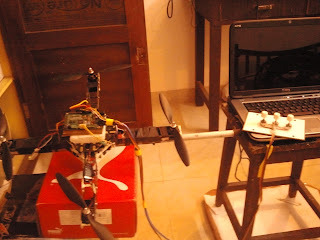 So, in my case the Quadrotor( technically called) was not worked upon overnight like as in the movie, it was the longest project that consumed something like a year to complete. It wolks by having 4 propellers ( 2 rotating clockwise and other 2 anti clockwise) to provide upward thrust.I would be explaining the technicalities involved below. 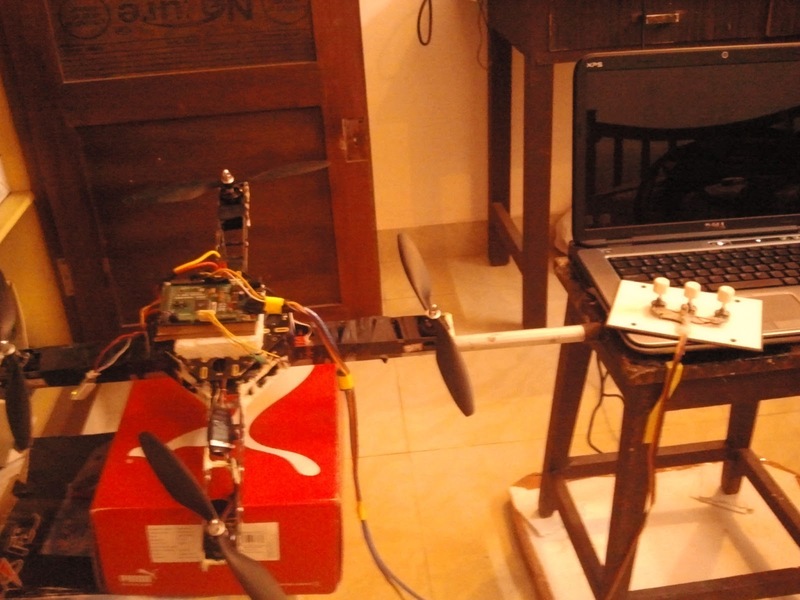 Here, the main objective of this project was to stabilize the yaw, pitch and roll axis's of the quadrotor as by merely applying a uniform thrust signal to them together will only result in the copter being flown away or in the worst case chopping off your head. So, to get a happy ending, the system needs to be stabilized. 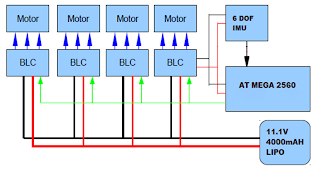 So the story begins with an IMU (Inertial Measurement Unit) which is used to detect the real time attitude of the quadrotor in space, the 6DOF IMU consists of an accelerometer and a gyroscope , whose values are read by an I2C protocol using a microcontroller. 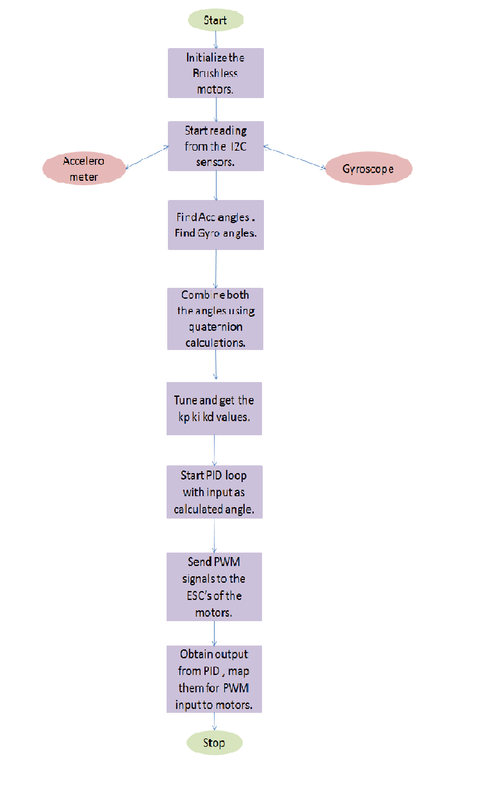 This sensor's data is processed and applied to a quaternion based algorithm to yield the various yaw, pitch and roll angles of the quadrotor with respect to a reference point.So now we have the current state, next a PID (Proportional Integral Derivative) algorithm is used to bring the quadrotor to the stabilized position by detecting and reducing deviations from the steady state. The most fundamental part is tuning for the PID constants Kp, Ki, Kd , which was done by the same old trial and error method, after which filtering and estimating the angle values with minimum delay can be considered as a killer. 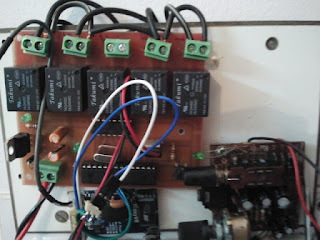 The program loop is 115Hz.The most exciting part of this project is the ability to work with the highly powerful brushless motors (and there are 4 of them) achieving rpm's >10,000. 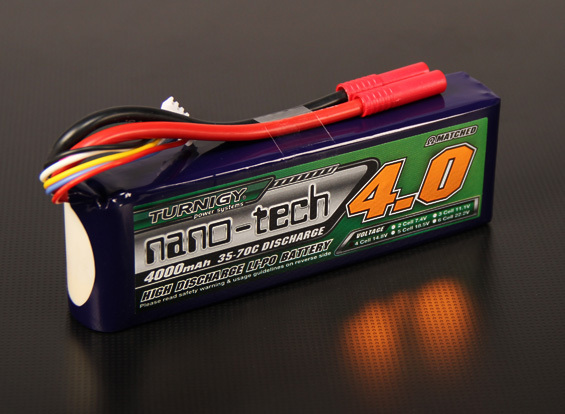 These motors need to be powered using a ultra powerful but compact light weight battery (as it adds to the payload) and hence comes in the LiPo (short for Lithium Polymer), I have used a 4000mAH, 75 C, 3S turnigy battery. 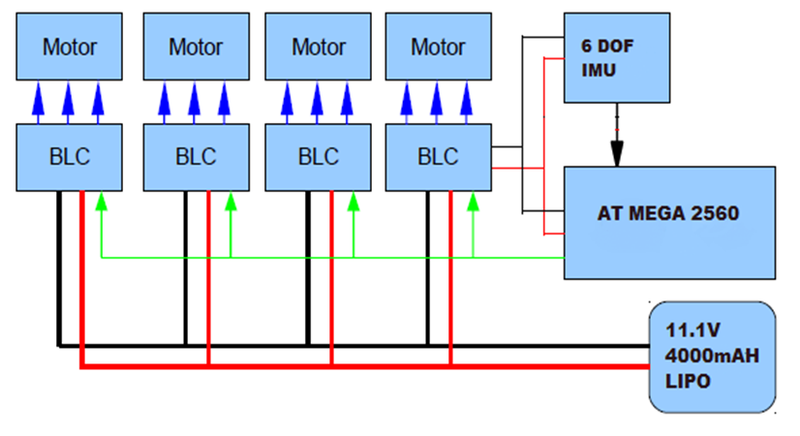 The motors are controlled via ESC's (Electronic Speed Controllers), which are indeed controlled by a microcontroller using PWM (Pulse Width Modulated) signals. The microcontroller used here is an ATMega 2560, due to the high EEPROM capacity (256Kb). It's PWM pins are directly connected with the ESC's, the next connection is from the IMU to the controller. I had the honor to showcase my project (RideSmart, as it got renewed) for controlling all the basic car features such as Air Conditioning, Central Locking, Engine Start, Acceleration, Parking Lights, etc using a normal smartphone. 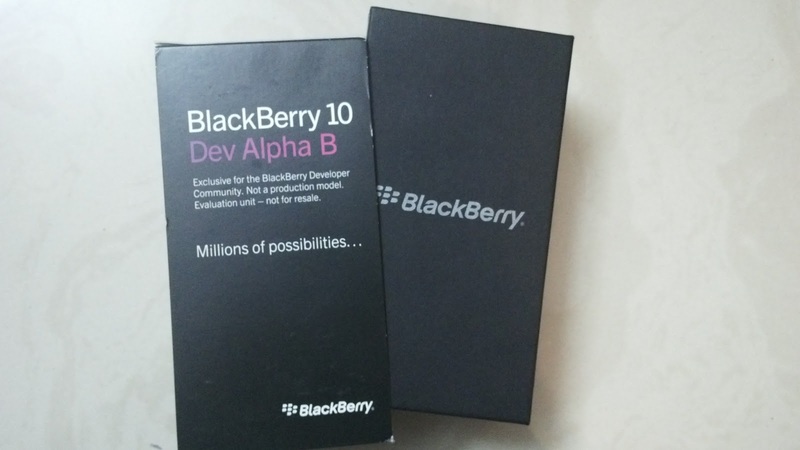 The system has now been redesigned for the Blackberry OS10 based smartphones running on the QNX kernel. The application is now faster, smoother and sexier than before. 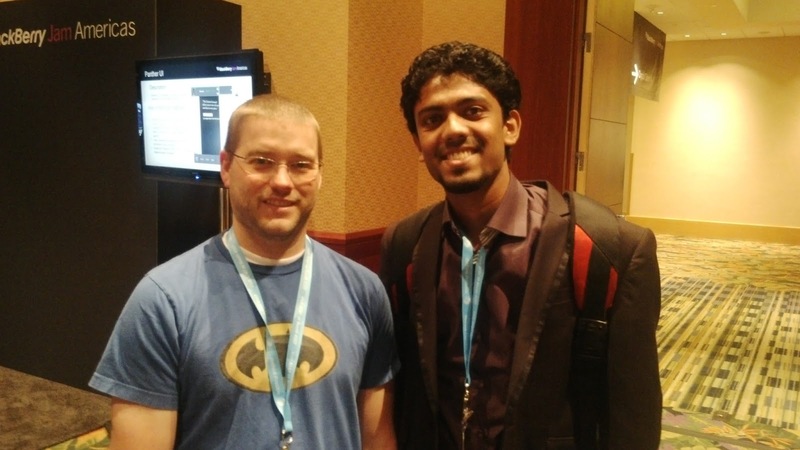 I was given the honor to meet Mr.Sijo Kuruvilla George (CEO Startup Village) via Mr.Anand Subramanian again via Mr.Jithu KM. I was able to impress him using this application , and with the help of a small demonstration too. 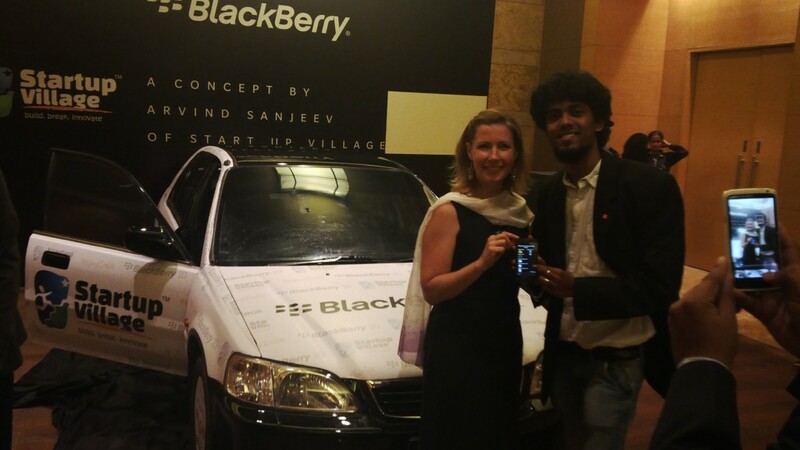 Mr.Sijo was then able to connect me with Mrs.Annie Mathew (Director, Business and Alliances at Blackberry) , who was also pretty driven by this . 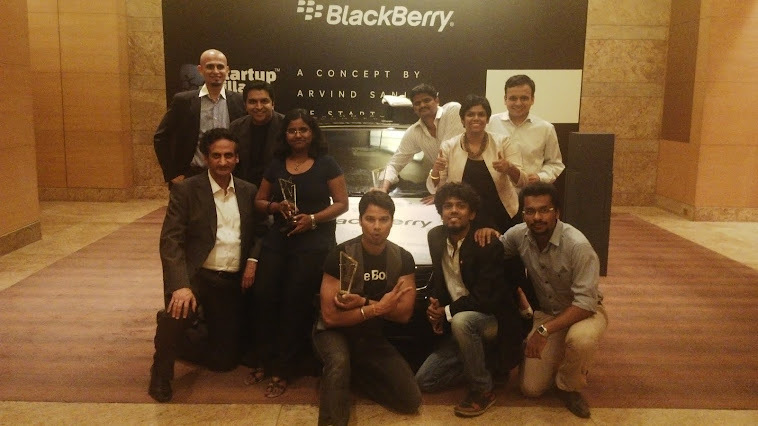 She then granted me the opportunity to showcase this project along with the car during their Blackberry OS10 launch that had taken place at February 25 at Mumbai.Blackberry had also let me get my hands on the latest BB OS10 device, for further testing and development of the application. The phone is pretty powerful, with a sweet cam and sweeter UI. The event was able to grant me with a huge number of well wishers including Mr.Sanjay Dutt (Managing Director, Blackberry India). 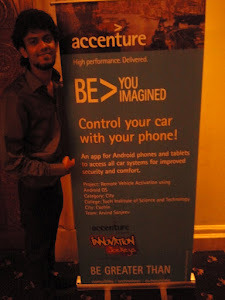 The event was a huge success especially with the presence of Ranbir Kapoor. The event had journalists from different parts of the world to cover the launch. 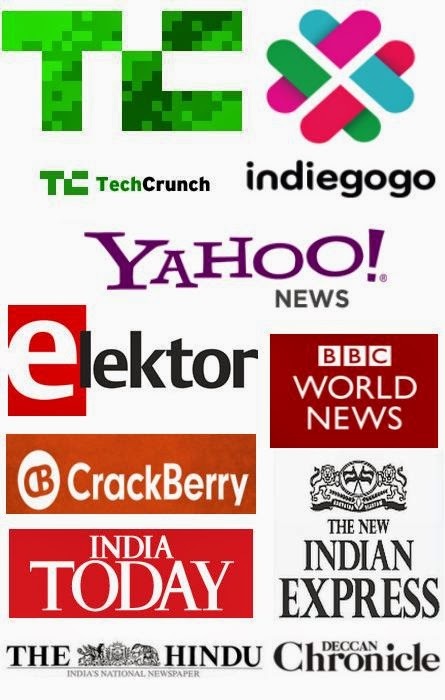 Many journalists covered the project, which led to the widespread publishing of it in many newspapers, news channels, blogs,etc. As I was given the opportunity to become a Blackberry Elite VIP member I was able to attend the Blackberry Live conference at Orlando, USA. Other than that I had access to various blackberry products, softwares and direct access to many people there. 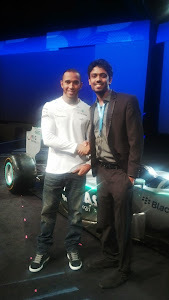 The experience at Blackberry Live was excellent. 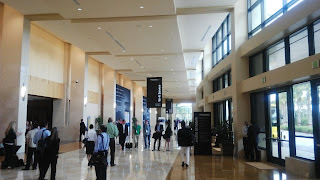 I was able to attend sessions by the CEO Thorsten Heins , by the CMO Frank Boulben and even the influential Alicia Keys. 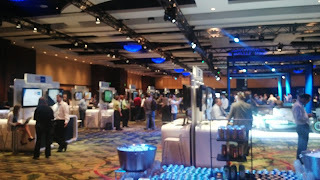 The conference was amazing, with every attendee getting a cool new BB Z10 device!! 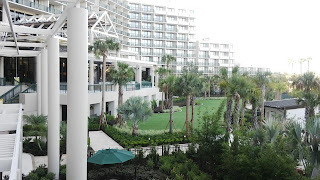 Being an elite member also gave me several other priveleges such as to interact and meet with the CMO Frank Boulben , Alec Saunders, the Vice President of Developer Relations, etc. The Conference was held in various sessions and common meetings across different halls and rooms. It saw people from all over the globe, even though particularly few Indians . 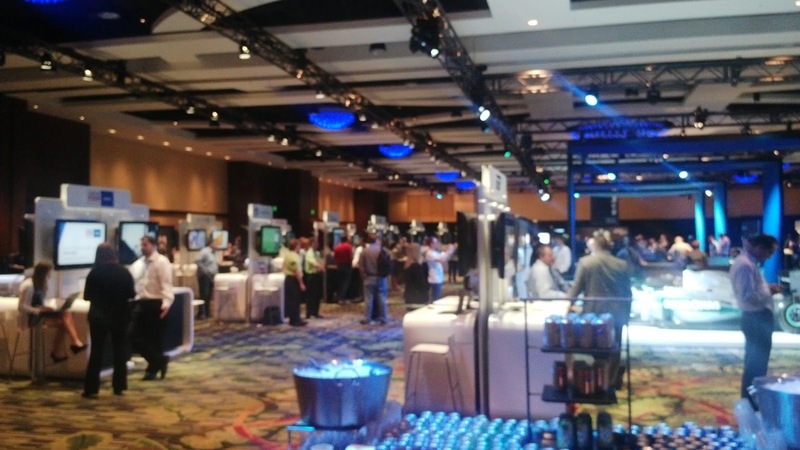 It continued for 3-4 days, with sessions ranging from enterprise solutions to basic app development. There were a whole lot of volunteers dedicated for this too. 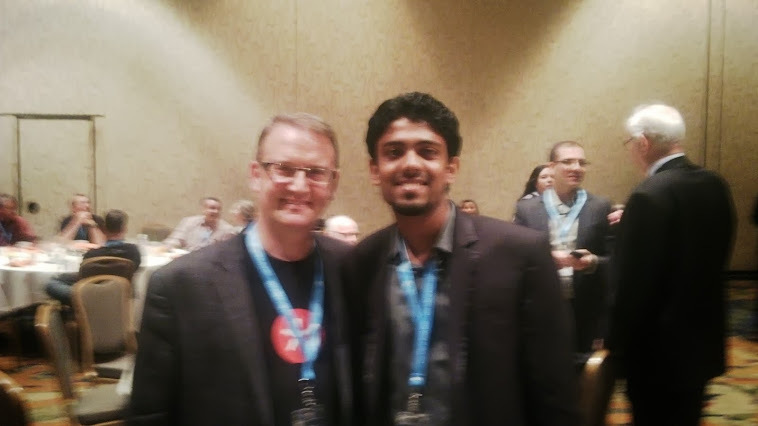 With Tim Neil of blackberry , the guy behind the Batberry project (he has build-ed a bat mobile from scratch having real gun replicas and while using a Blackberry10 platform for it's control, that's truly WOW!! The main reason for me to do this project Gspeed was that, I was incapable of carrying around something small without losing it one way or the other. In this case, I used to consistently lose the keys to my Honda Dio scooter which led me to making a bunch of duplicate keys for it. Even though, these keys would work fine, I began to think about what someone can do if they obtained the keys to my scooter. Well, obviously being from where I am that sounds no good, so I designed this fail proof or a fool proof system for security while simultaneously serving other uses as well. Here, the pass code has to be entered via this keypad provided on the scooter’s dash, whereas the system activation switch is the red missile switch to the right above it. To safely enforce the device, the missile switch cover has to be merely shut down after use. 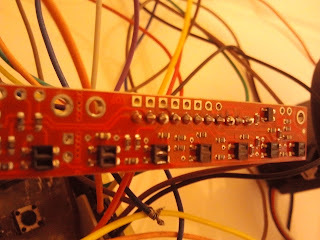 The system, I designed works by first switching on the system ON switch and then inputting the ‘n’ digit pass code combination and then pressing the key ‘A’ to enter it. To change the pass code, the user simply has to enter ‘B’ and then enter the present pass code, if that is right then the user may enter his new pass code and then press ‘A’ to save it. The visual feedback of this process is seen via a LCD screen mounted on the scooter as you shall see in the working demo video below. The system as soon as it is activated then leads on to the GPS speedometer aka Gspeed user interface that is the same GPS based speedometer I had developed for my scooter earlier as explained and portrayed in project no: 2 in this blog. It has the following functions: Present speed, lap time, surrounding temperature, latitude and longitude coordinates, fuel level, date, time, and other vehicular information like registered number, etc. 1. Firstly, it does not allow any guy who thinks he can steal my Dio using a key that I lost hehe. 2. The system is a full proof protector; it won’t allow functioning without the correct pass code. 3. Allows spontaneous pass code changing options. 4. 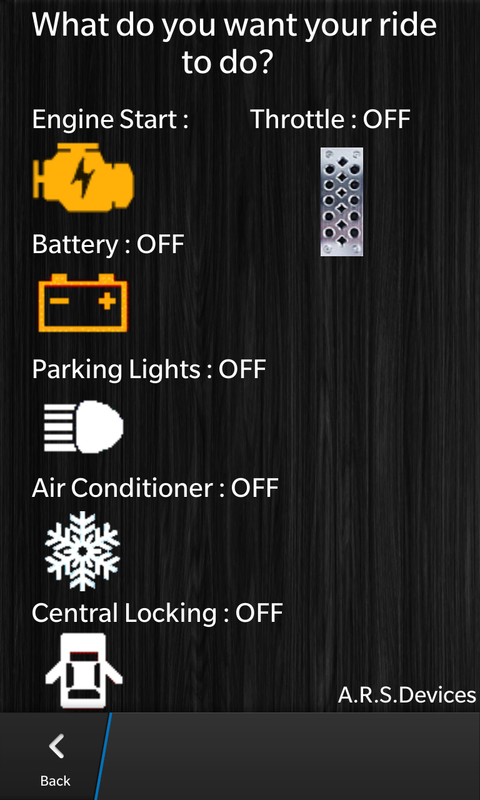 Does not require use of keys for access, a keyless operating system. 5. Allows a user to safely park his vehicle without having the tension of anyone trying to hack it using a duplicate key or other methods. 6. 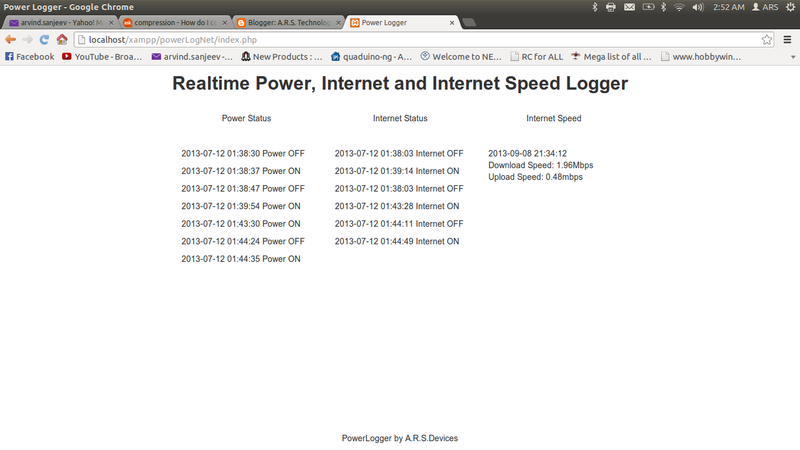 Provides GPS based speed data and a bunch of other data from other sensors. 7. Sleek and stylish design even looks cool. 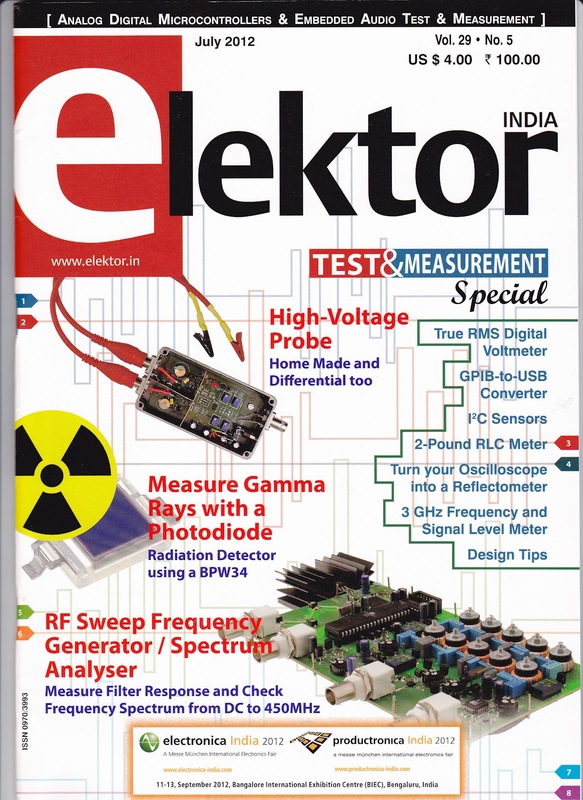 I was fortunate enough to publish my project for the international electronics magazine Elektor, as per the request of it's editor Ms.Savita Jayaram. 1.Users are capable of communicating with the device naturally through speech. 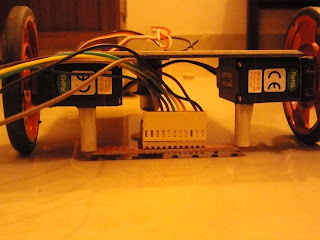 2.Users are not required to reach the switch board and turn the switches on manually. 3.A person can use the device from anywhere in the room, by merely using these speech commands. 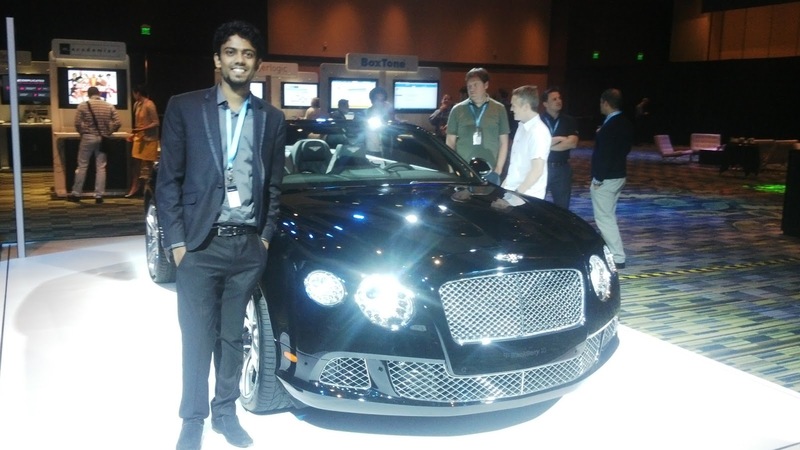 4.A wide variety of applications including the control of autonomous robots via voice commands. 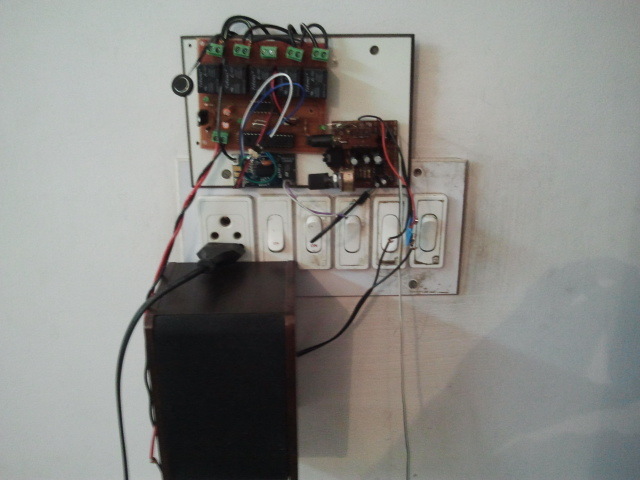 5.Improved room security providing password protection feature for securing the room. 6.The system provides a vocal feedback to the user as well , to acknowledge the commands. Once I studied that i could control all the functions of a scooter, using a bit of android programming, I moved off to something bigger and useful. I first tried out my system on my friend's Honda City, as my father wan't ready to give me his car. After a bit of persuasion from his colleagues , he agreed to give it to me. 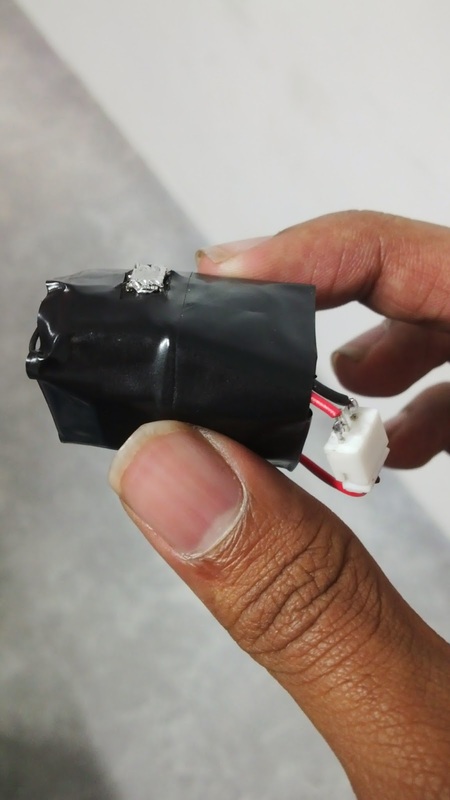 In the case of my friend Sunil's Honda City, I had to figure out the wiring for the igniton and engine by just using an ordinary multimeter. I was so happy when those headers roared for the first time at the push of a button from my phone. After , working on the Honda City I moved on to my Santro Xing, now I didn't want to take any risk ,so I went directly to the Hyundai service centre and with the expertise of the technicians I was able to understand the wiring of my car, I was thrilled by the response of the people at Hyundai once I showed a demo to the entire staff there. I have applied for a patent on this system via my advocate Tommy Mampilly, the application was sent to the Chennai patent office. 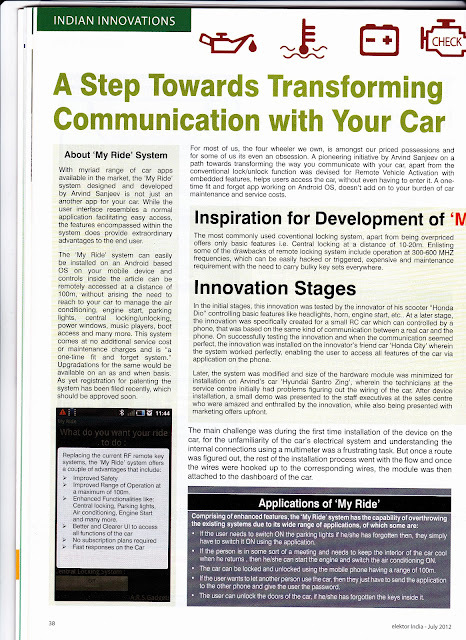 The system canonly be used if the car is resting in the neutral position and if the hand brake is activated. As, I was introduced to the exciting new world of android, I became aware of it’s infinite possibilities. I found out different ways to manipulate the android O.S. , to create softwares that had functionalities extending from beyond the phone itself. 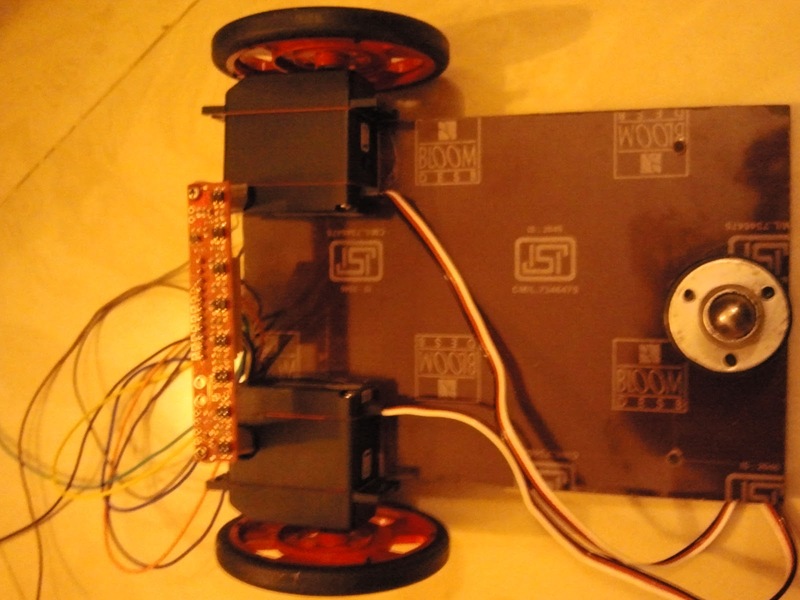 In this project I have created an android software to control a small model of a car, which is also integrated with a line follower mode. Even though the motor speed’s not significant enough , I am able to completely control it using phone. The different functions programmed into it are: front, back, left, right and stop. 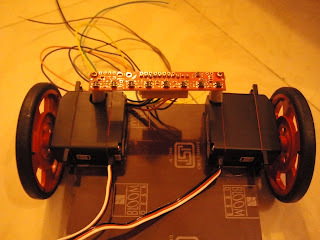 And, the most unique thing is that it is programmed with a line follower mode, i.e., if you press that particular button then the robot becomes completely autonomous and begins following a black line.All this can be done at a distance of 100m from the RC car.The type of connection used here is based on bluetooth working at about 2.5Ghz, preventing the distortions that may occur at lower frequencies. I started off by programming my phone with the basic UI to control my car, providing separate buttons for each type of movement of the car.I transmitted the corresponding commands via bluetooth to my RC car, the car then decodes these bluetooth signals via a bluetooth module, and the microcontroller identifies these signals and does the particular function corresponding to that button.My RC car uses a differential drive system, hence it requires only two servo motors in the front and an omni directional wheel at the back.And the best feature which is the line follower mode is enabled once that particular button is pressed. 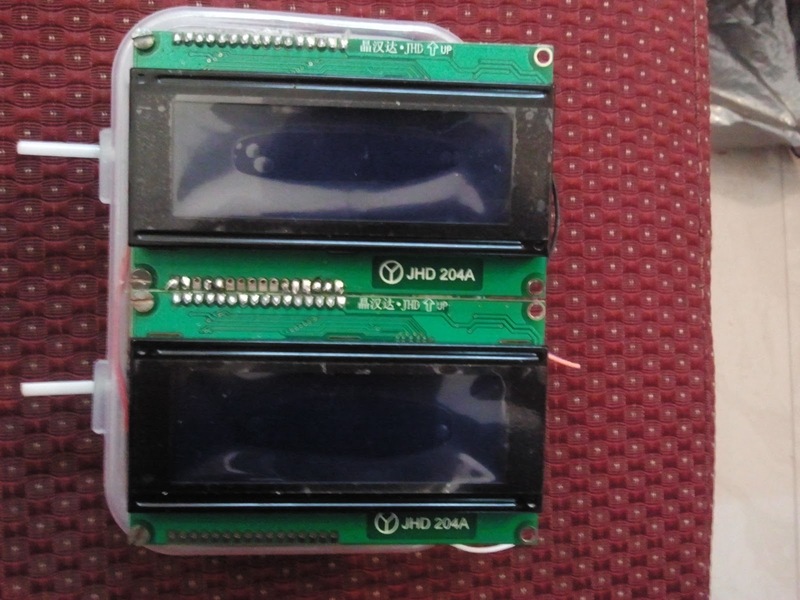 1.Can be used as a remote spying device , controlled using any ordinary android phone. 2.Apart from the conventional RC cars, here you just have to buy the car no need for the transmitter, you just need an android phone. 3.Any user having an android phone can control the device using my software. 4.The device also works as an autonomous robot, in the line following mode. 5.Can be equipped with cameras and sensors for surveillance and monitoring. 6.It can be the best source of entertainment at your office desk. 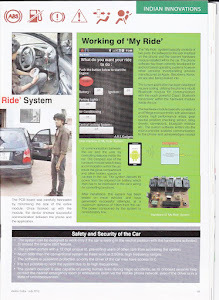 Project 6 - Android Controlled Bike , Android Controlled Scooter or Two Wheeler "Patent Protected"
Okay, this project is the one that has been "patent" protected it, showcases the world's first android phone controlled scooter (Honda Dio), this concept is purely unique, and has many applications.I have created an application for an android pone to control the basic functions of a scooter. Even though i had to wait for a long time to get an android phone,thanks to my mom I got one of the best available sets, the Samsung Galaxy S, even though any android phone can work with my application.The idea came to me while i was in bed, cluelessly thinking about stuff when i was not able to sleep during my exam time. 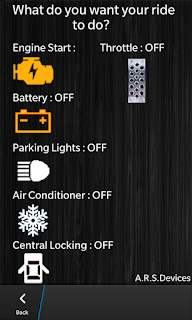 After taking a crash course on eclipse and java programming using the internet, i was able to do the programming for my phone to send the necessary bluetooth commands. In the case of the headlights , it remains ON until the user presses the OFF button via the android application.So by using my application (My Ride) , a person can turn the engine ON, or the headlights ON or the horn.All these functions can be accessed through the phone from a distance of about 100m, depending on the surroundings. 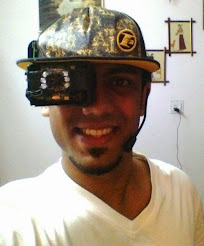 I have tested and used the system on my Honda Dio scooter, making it the world's first android phone controlled scooter. 1.Provides keyless accessing , no need to carry those bulky key sets ,when u just need an android phone and my application. 2.No other system, allows you to access the headlights , horn as well as the engine accessing capabilities. 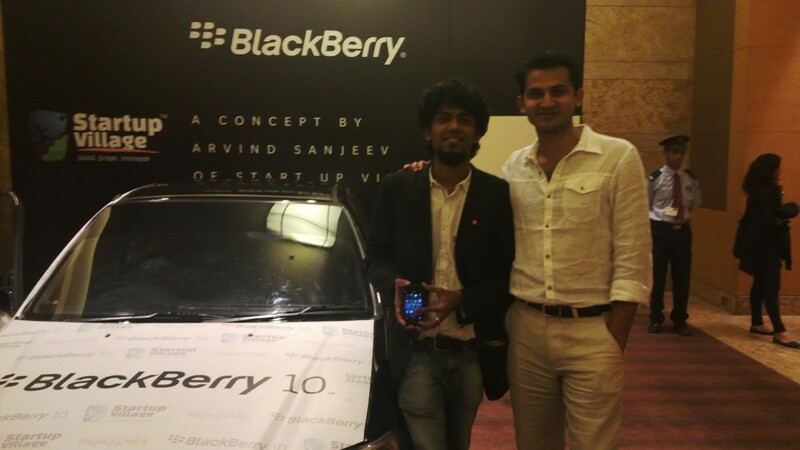 3.Provides a total anti theft solution , as the vehicle can only be accessed and used through your phone. 4.Even when another person , having the same application and system installed in his vehicle, tries to access yours, it wont be possible as i have provided a 12 character identification id for each vehicle. 5.No need to worry about loosing your keys, if you would like another person to use your vehicle, you could just send the application to his phone. 6.The system has a range of about 100m unlike no other remote controlled system, increasing range of accessing. 7.Can be used for other purposes like cheap show offs or to play a prank on someone,etc LOL. 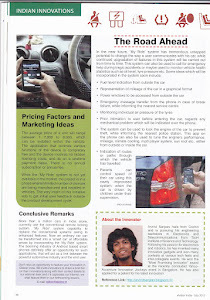 This is first and one of a kind system created by Arvind Sanjeev, patent protected <A.R.S.>. I know that line following robots are very common , but what makes my robot so unique, is its high precision and accuracy and it's ability to follow any line at any and every sorts of curves. The basic principle behind it is that, the reflecting properties of a black line are much more negligible as compared to a white surface, so using a sensor which simultaneously sends out an IR (Infra Red) beam as well as, absorbs the reflected beam from either a white surface or a black line using it's IR receivers. 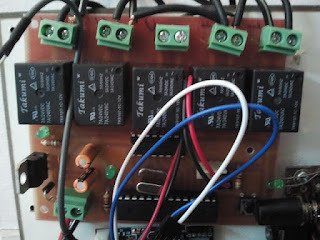 So, by monitoring the voltage across this sensor, and by proper programming, we are able to make the robot follow the black line. Another interesting feature of my robot is that it automatically stops , when it reaches a strip of horizontally placed black tape, the black line made here is just by using ordinary insulation tape. The motors are powered using 6V batteries (AA), and the servos are programmed and controlled via PWM (Pulse Width Modulated) signals, these are continuous rotation servos providing 360 degrees of freedom. 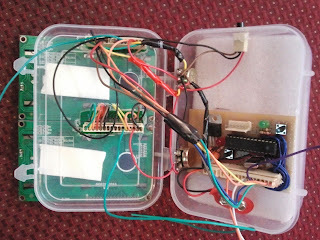 Okay, this is one of the things which I made under 4 hours, it is a portable GPS location monitoring system, which can be carried around by a person usually adventure seekers or trekkers, to know their exact position , as GPS data is obtained directly from the satellite, you can use this device to find out your location on any part of the Earth. 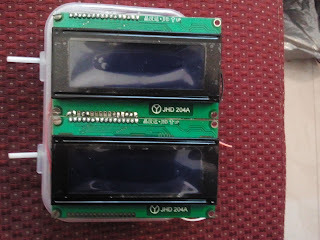 It can be easily carried around due to its compact design, it can be used in cars, buses, etc,and the greatest advantage is that it's cost, conventional GPS systems cost from about Rs.9000, I can provide the basic GPS data at about Rs.3000. This system can be used for professional runners to monitor their speed of movement, as it is displayed on the 2 20*4 LCD displays provided.I have used a cirocomm 20L GPS module for the purpose. The NMEA data from the module is deciphered using a Tiny GPS library, to extract the latitude,longitude coordinates as well as universal date and time.The system may even be attached to the helmet of a bike rider , so that ,these data become more accessible to the person. 2.Provides temperature monitoring of the surroundings. 3.Provides the speed of motion. 4.Very potable and easy to carry. 5.Provides the most accurate time(universal) and date. 6.The total time for which the system has remained active. 7.Can be used in emergency situations , to know the location while sending out a distressed call. The video showing the working of the system is as shown here, please excuse the shaking and vibrations which caused due to my jogging( in order to demonstrate it's working). 1.Can be used by athletes to measure their speed of movement. 2.Can be used by adventure or thrill seekers while trekking in dense forests to know their location, when cell networks are not available. 3.Can be used in cars or buses , for knowing the location and the speed of the vehicle. 4.The latitude and longitude coordinates can be used while making a distress call, to inform the authorities of our location. 5.Can be used as universal speedometer for all sorts of vehicles,without the need of providing any modifications. 6.Can be used even in the most remote corners of the world. I can proudly say that this was one of the projects which made me the happiest.It earned me recognition in a lot of places around Kerala.It is actually a Hovercraft, i.e., an amphibious vehicle which can travel through land ,ice, water, etc. I made my hovercraft from nothing but normal household junk, which was lying around in my house, all rusted and worn out, I used a 900W meenu mixie motor(one of the oldest of Indian mixies) and a 1200W 230VAC motor drom a Eureka Forbes vacuum cleaner, about which my parents still have no clue about.I used rectangular sheet of MDF wood as the base with its corners chipped off. The most important part of a hovercraft is it's skirt, there are many skirt designs available like bag skirt ,wall skirt, finger skirts,etc they all have their unique purpose. The first motor is used to provide forward propulsion to the craft and the second motor provides a vertical lift,by building up air pressure beneath it, and encapsulating it using a skirt. The next step of the build was the setting up of a driver control system to control it. What makes my hovercraft unique from all the others are that , it is controlled using a glove which you wear in your hand, the instructions to operate it is as shown in the video below.I even hooked it up with GPS, so that we can find out it's current location. I used an ADXL 3-axis accelerometer sensor(it works on the piezo electric principle) for tilt measurements of my hand, the data communication was using 2 Xbee modules(2.4GHz), the hovercraft has a load of other features explained in the video below,I used 2 servo motors for the rudder(to control the direction of movement) and another for a LED array.I can control my hovercraft from about 30 feet away. 1.It is completely controlled using a glove(worn by the operator) ,completely unique. 2.Turning the craft on/off is controlled by the vertical motion of the hand (as in video). 3.It is hooked up to a GPS module, to provide the speed of movement and the correct location. 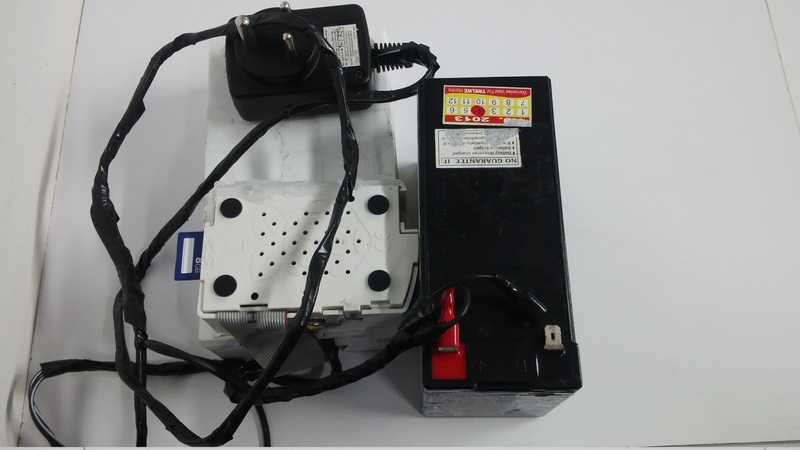 4.It is provided with temperature monitoring of it's two electric motors. 5.Automatic light detection, when it moves into dark regions , it lights up an array of high power LED's on the front, it turns off as soon as it enters into a well lit area. 6.The LED light array points correctly to the direction of movement, providing enhanced vision. 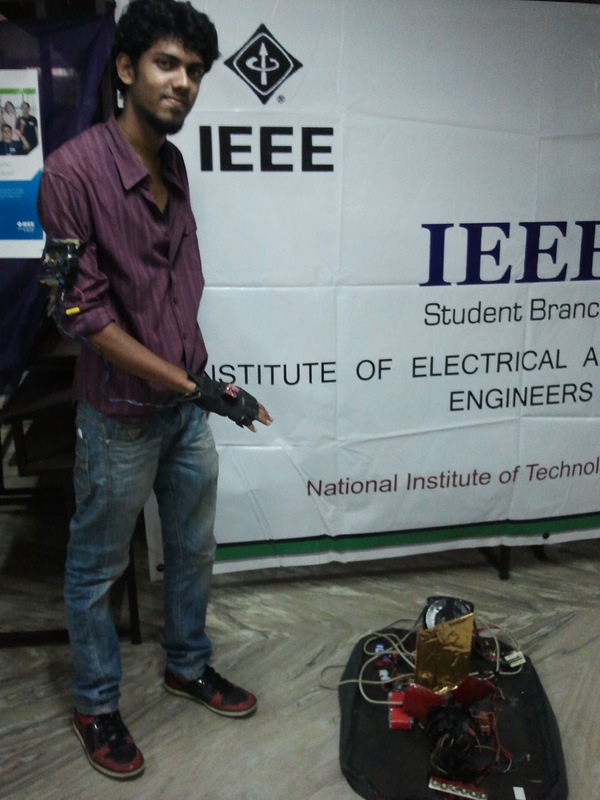 7.The glove provided for control is very user friendly and requires minimum expertise to operate. 1.It can move smoothly cruise over paddy fields and agricultural lands, hence they can be used to spray pesticides onto wheat, rice ,etc crops without providing a path for its movement unlike tractors which require a plain path, which further reduces the effective area for crop development. 2. 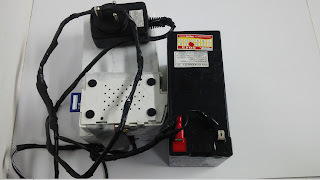 Used in cases of natural disasters like floods for emergency purposes, to access remote places which are not approachable through land, and to move over debris . 3. They are used in military applications in tanks, etc. 4. They are used also for civilian transportation in hostile environments. 5. They are used in mine detection, as they float on top of the ground they cannot trigger off a land mine when they move over it, hence they can safely move over mine fields. 6. It is used in areas that experience extreme winter as they can move over thin layers of ice without breaking it. 7. It is an amphibious vehicle, hence its range of operation is very high. 8.It can be used in low water level areas to check for the water level, so we could find out whether that huge ships can pass over it or not. 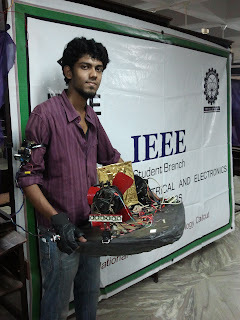 1.I prize at NIT(National Institute of Technology,Calicut) for IEEE interface competition. 2.I prize at St.Joseph's Engineering College,Kottayam. 3.II prize at St.Gits Engineering College,Pala. 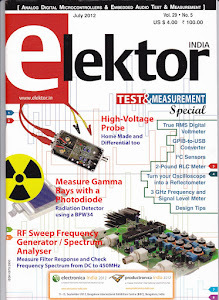 My Project selected , selected from over 3000+ entries from India. A.R.S. 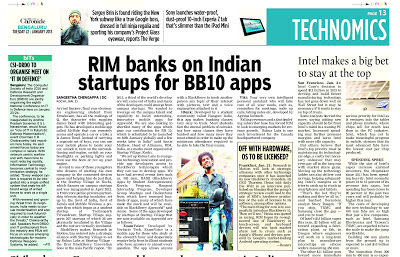 Innovations & Gadgets. Awesome Inc. theme. Powered by Blogger.